In this first archive story by Kristian Bertel, we meet a sweeping man in the city of Jaipur in Rajasthan, India. Jaipur, the city of victory, is chaotic and congested, though it still has a habit of tickling travelers pink. Stunning hilltops forts and glorious palaces fit like the footprint from a rich royal past. All things that blaze a trail through brilliant bargain-filled bazaars, and fluttering sarees catch the eye like butterflies. In Jaipur the photographer portrayed a man sweeping the ground in Jaipur, India. 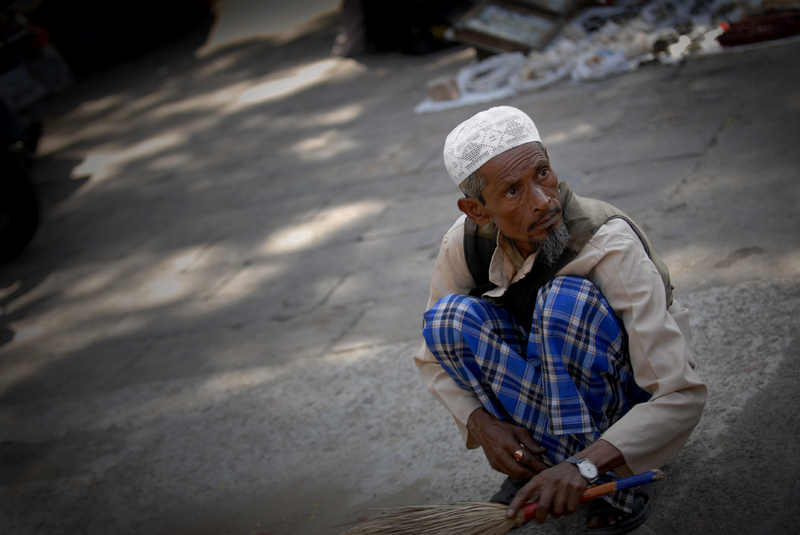 The Indian man in the photo is sweeping the pavement in one of the main streets of Jaipur. The city is the capital of the Rajasthan province. Jaipur, Rajasthan's capital, is an enthralling historical city and the gateway to India's most flamboyant state. The city's colorful, chaotic streets ebb and flow with a heady brew of old and new. Careering buses dodge dawdling camels, leisurely cycle-rickshaws frustrate swarms of motorbikes, and everywhere buzzing autorickshaws watch for easy prey. In the midst of this mayhem, the splendours of Jaipur’s majestic past are islands of relative calm evoking a different pace and another world. At the city’s heart, the City Palace continues to house the former royal family, the Jantar Mantar, the royal observatory, maintains a heavenly aspect, and the honeycomb Hawa Mahal gazes on the bazaar below. And just out of sight, in the arid hill country surrounding the city, is the fairy-tale grandeur of Amber Fort, Jaipur’s star attraction. As a photographer and traveler in India it is hard to ignore the working conditions in India. Conditions that are not like we see in the west. This man pictured above was literally sitting on the ground to sweep. A majority of labour in India is employed by unorganised sector. These include family owned shops and street vendors and above is a labourer in the unorganised retail sector of India. Given its natural rate of population growth and aging characteristics, India is adding about 13 million new workers every year to its labour pool. India's economy has been adding about 8 million new jobs every year predominantly in low paying, unorganised sector. The remaining 5 million youth joining the ranks of poorly paid partial employment, casual labour pool for temporary infrastructure and real estate construction jobs, or in many cases, being unemployed. The man in this archive post was portrayed near the bazaar in the city centre in beginning of the day. An evening visit is a complete assault on the senses, the colors, the sights, the sounds and the smells. There are different specialist zones, whether it's food, flowers, textiles, carved statues or plumbing. While you should always be wary as a traveler be sure not to completely close yourself out to the locals as one of the highlights of Rajasthan is the chance to interact with the friendly people. Jaipur is a brilliant colorful explosion of flowers, elephants, ox carts, and wares. The traveller will smell the deep aroma of spices in canvas bags, the fetid smell of animals and open sewers, the sweet waft of tea, and the crusty acrid burn of dust and exhaust. The noise is chaotic, the people constantly will stare if you are a Westerner and anybody who has something to sell will try to sell it to you, repeatedly. Watch cobras dance out of their wicker baskets, and don't be too surprised if the snake charmer slaps his cobra for having a wayward eye. Be prepared to be asked for money if you plan to take photographs of snake-charmers and beggars.